The age of smart manufacturing is here, leveraging digital innovations such as the Internet of Things, artificial intelligence, data analytics, machine learning and cognitive computing. Gaining greater control over manufacturing and supply chain is more achievable than ever to predict and prevent downtime, mitigate bottlenecks and defects, and position an organization as a digital leader. Companies that have successfully invested in digitalization/IoT are realizing significant value from operational excellence enabled by new-age technologies. However for charting an aspirational yet realistic roadmap, identifying the right partner for the digital journey remains a top concern as organizations look to embrace digital. Due to rapid changes in global marketing dynamics and consumerization of AI technologies, AI applications are also gaining wide acceptance in the consumer segment. However, implementing industrial AI applications requires an in-depth understanding of the right data sources, data acquisition methods, domain expertise, process complexity, compliance with regulatory requirements, assessment of failure costs, and workforce impacts. While AI in manufacturing promises massive leaps forward in productivity, environmental friendliness and quality, research shows that we are still at the early stages of wide spread Industrial AI adoption in manufacturing. into Digital Transformation. Hitachi Consulting is uniquely positioned as a ‘Consulting-led Industrial Digital Solutions company’, and provides end-to-end solutions from consulting through implementation to support for customers embarking on their Digital Transformation journey. "Hitachi Consulting provides deep understanding of integrated organizational digital transformation and globally recognized Industrial Internet of Things(IIoT)solution"
•Delivering AI and IoT-enabled smart manufacturing solutions leveraging a combination of its Consulting know how, deep domain expertise, Operational technologies expertise, IoT capabilities and Industrial AI & Data Analytics capabilities. “With a rich legacy of delivering unique solutions to complex manufacturing industry challenges globally, while aligning with market dynamics locally, Hitachi Consulting is one of the leading providers of Digital Transformation solutions. The key is really to offer a unique blend of competencies including Consulting, Domain, IoT and AI/Data Analytics to deliver successful end-to-end-transformative solutions rather than deliver shrink wrapped point products. 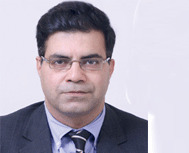 We firmly believe in the concept of co-creation with our clients to deliver value added solutions spanning the entire manufacturing industry value chain from planning through production, quality, maintenance and supply chain,” explains Rajesh Devnani, Vice President – Global Solutions Management, Hitachi Consulting. Leveraging decades of OT and IT expertise, business process and industry experience, Hitachi Consulting has been working with a diverse set of customers to develop and implement practical business strategies and technology solutions that enable measurable business value and sustainable ROI.